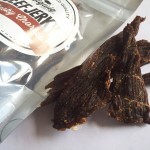 Home » What Is Beef Jerky? 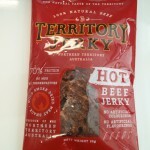 Many people ask “what is beef jerky“, well beef jerky is essential dried meat. It is made from lean meat which is trimmed of all the fat, then cut into thin 1/4 of an inch strips. These strips are then marinated in special spice mixes or marinades for flavour and then dried out to avoid any spoilage. Usually salt is a major ingredient as this prevents bacteria from forming before enough moisture if removed from the meat. 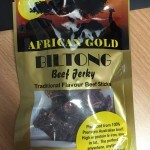 Beef Jerky, as it’s name suggests is made from Beef. The leaner the beef the better. Most people use topside beef as it generally is cheaper and less fatty than traditional cuts of beef. There are many jerky products on the market today. While the majority use sliced meat, others consist of highly processed meat which is chopped and formed into a “meat paste”. While drying the meat out and adding salt is the best way to avoid spoilage, companies who have a wetter, soft jerky include preservatives to ensure a longer shelf life. Beef isn’t the only meat that can be turned into Jerky. Game meats such as elk, bison, emu, crocodile and kangaroo are regulary used to make exotic jerky. All these meats are very lean therefore make perfect meat for jerky production.